"Total defeat in Vietnam 30 years ago should have been a warning to the U.S.: wars are too complicated for any nation, even the most powerful, to undertake without grave risk. They are not simply military exercises in which equipment and firepower is decisive, but political, ideological, and economic challenges also. The events of South Vietnam 30 years ago should have proven that. It did not." Gabriel Kolko, Lesson from a Total Defeat for the US: The End of the Vietnam War, 30 Years Ago, Counterpunch April 30/May 1, 2005. As the similarities between the catastrophes of the US invasions of Vietnam and Iraq become steadily clearer it's worthwhile to take a look back at the earlier one. One of the most significant events of the earlier disaster was Captain Howard Levy's refusal to train Green Beret units of the US Army in preparation for their deployment to Vietnam. To show my support for Captain Levy's courageous stand I visited him in Fort Jackson in the spring of 1967 where he was being held prior to his Court Martial. Here's my description of that visit. If you haven't already done so, you might want to take a look at a clip from the Vietnam War documentary, Sir! No Sir! on this website. On 28 December 1966 Captain Howard B. Levy was advised by the Commanding Officer, United States Army Hospital, Fort Jackson, South Carolina, that charges had been filed against him for willful disobedience of a lawful order to train Special Forces Aidmen, and for making public statements designed to promote disloyalty and disaffection among the Armed Forces. When all charges had been assembled there were a total of five. Charge one was the willful disobedience of the order under the provisions of Article 90 of the Uniform Code of Military Justice (UCMJ). Charge two, drawn under Article 134, alleged that Captain Levy had made statements that were designed to promote disloyalty and disaffection among the troops. Additional Charge One stemmed from the same statements and alleged violation of Article 133 of the Code. Additional Charges Two and Three alleged violation of Articles 133 and 134 and were based on a letter attacking United States foreign policy in Vietnam and forwarded through a friend to a noncommissioned officer then stationed in Vietnam . Beginning with the Fall semester in 1964, I was a graduate student in the physics department of New York University. All of my classes were at the Bronx campus on University Avenue and I had rented an apartment at 1991 Sedgwick Avenue adjacent to the campus. By 1966, most of my classes were at NYU's campus in the Washington Square section of lower Manhattan and in the Fall of that year I moved to 1143 43rd Street in the Borough Park section of Brooklyn. Sometime in early 1967 I became aware of Howard's principled feud with the Army. Beginning about 1965, I was a regular reader of the National Guardian, a solid left-wing weekly newspaper. While the standard media, i.e., the "centrist" NY Times, the "liberal" NY Post edited by James Wechsler, and Walter Cronkite's "centrist" CBS evening news were airing the government party line on the war in Vietnam, the Guardian had its own sources there, principally Wilfred Burchett, which gave an unerringly accurate picture of what was happening. My best recollection is that I learned of the Army's problem from the Post and the Guardian. My first reaction was to write Howard a letter of support which, in the absence of better information, I simply addressed to him at Fort Jackson in Columbia, SC. Sometime later, one of the press reports said that his parents lived in Brooklyn, NY with enough additional information that I was able to find his parents' phone number in the Brooklyn phone book. I called the number late one afternoon and got them on the first try. After I told them of my interest in Howard's case they invited me to visit them. Coincidentally, they lived only a few miles away from me and with the help of a Brooklyn guide book I was able to find their address on a local street map. I found their apartment house easily, rang their doorbell in the lobby of their apartment house, rode the elevator to their floor, and was cordially greeted by a solidly middle class and middle aged couple in a tastefully decorated and very neat apartment. Mrs. Levy offered me a cup of coffee and a generous slice of a home-baked cake and we started to talk about Howard. The flight from La Guardia Airport to Columbia, SC. Mrs. Levy said that the Army was well aware of Howard's anti-war position, that his commanding officer had deliberately given him an assignment that his conscience would not let him carry out, and on this basis she was convinced that Howard's commanding officer was out to "get" her son. She made a point of Howard's love of his country and showed me the American flag on the wall of his tidy room. I estimate I spent a couple of hours with the Levy's. Just before I left I asked if I could visit Howard. The answer was yes and the procedure was simply to go to the building, the number of which she gladly gave me, in Fort Jackson, South Carolina in which he was currently imprisoned while he awaited his court martial. Within a few weeks after my visit with the Levy's, I booked a morning round trip flight from LaGuardia Airport in New York to Columbia, South Carolina. On the southbound flight I happened to be seated next to a young black soldier from Brooklyn who had just completed his basic training and was being sent to Vietnam. He asked me to visit his parents on Herzl Street, which I subsequently did. His parents were opposed to the war. I got to Columbia, South Carolina in mid-afternoon, flagged a taxi, and asked the driver to take me to the numbered building in Fort Jackson the Levy's had given me. During the trip from the airport to my destination I started a conversation with the driver, a black man. 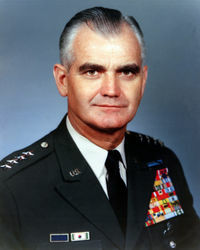 He was opposed to the war in Vietnam and was well aware of Howard's upcoming court martial. In 1967 I equated opposition to the war in Vietnam with a developed sense of class consciousness and it had been my experience that black people, on average, were invariably more politically advanced than whites. My recollection is that we took local streets rather than the interstate highways from the airport to Fort Jackson. Based on that, the most likely route we took is shown by the dotted line on the following map. Probable route of taxi from Columbia Metro Airport to Fort Jackson. As the gate to the base came into view, I was concerned about whether I would be allowed on the base because I had no formal permission to enter it. The driver stopped next to the MP guarding the gate and simply said he was taking his passenger to building X (I don't remember the actual number) and the guard simply waved us through. I was amazed at how easy it was to get on this huge Army base. Within a few minutes we were at the building, I paid the driver with a generous tip, and walked toward the entrance. 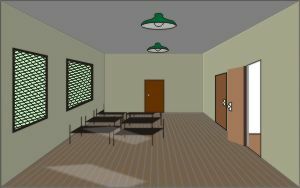 Type of structure where Howard Levy was held until his court martial. The building was a wooden, single story former hospital building about the size of a typical Army barracks. My recollection is that the building was painted dark green. I went up the four steps and into the door where an armed MP was seated at a desk immediately inside the doorway. I told him I was here to see Captain Howard Levy. He asked me to sign a visitors log. He then informed me that Captain Levy was limited to three visitors at a time and that there were currently two other visitors besides myself. At that point he told me to go inside and then to go through the first door on the right. My first impression on entering was that I was in a former military hospital ward. The windows were covered on the outside with heavy wire mesh. The beds had been pushed together in the far left corner. The first door on the right opened into a small room and was somewhat brighter than the main ward. My recollection of the appearance of the inside of the barracks where Howard Levy was kept until his Court Martial. There were three people in the room, a young woman and a man in civilian clothes, and Captain Howard Levy in uniform. Howard was standing with his back to a window and I introduced myself. As part of my introduction, I said that I had sent him a letter and wondered if he had ever received it since I didn't have his complete address at the time. He said that he had gotten it. I also told him that I had visited his parents and he gave me the sad news that their apartment had recently been robbed. From the way he said it, I got the impression that Howard felt that the robbery was politically motivated. I then sat in the remaining chair and the original conversation resumed. The dominant topic was the war in Vietnam including the administration's lies to justify it, the role of the Democratic liberals, the media, and the US anti-Communist crusade as the global context for it. Howard told us about a demonstration he had participated in at the University of South Carolina. The occasion was the university's awarding of an honorary doctorate to General William C. Westmoreland, who was then the Commander in Chief of US forces in Vietnam. Howard said he had carried a sign that said, "Westmoreland: War Criminal." Howard naturally dominated the conversation and I marveled at the clarity and precision of his speech and his fully articulated and radical political perspective. His manner of speaking was such that it could have been transcribed directly into publishable text. I took it as a sign of an unusually sharp intellect. This is the dominant impression of my meeting with Howard. General William C. Westmoreland: "War Criminal"
In Japan, such persons are called kamisori, which means razor or razor sharp. After about an hour, we were notified by the MP that we had to leave. Howard then asked me if I had a place to stay for the night. I said I planned to find a motel. He said that I should go to the house of a couple in Columbia who were friends of his and they would put me up for the night. He gave me their name and address. As the three of us left, the man asked me if I had transportation and I said I had come by taxi. He said that he had a car and would drop me off at Howard's friends' house. He had a Volkswagen beetle and as we drove we exchanged information about ourselves. He said he was a machinist and a member of the Communist Party. When we arrived at the house of Howard's friends I rang the door bell, they invited me in, and I slept on their couch that night. The next morning I got back to the airport and flew back to New York. A few months later I read that Howard had been sentenced to three years at hard labor. The war criminals were sending their accusers to jail. The analogy with the Hitler regime executing the members of the White Rose Group couldn't have been closer. "It is certain that today every honest German is ashamed of his government. Who among us has any conception of the dimensions of shame that will befall us and our children when one day the veil has fallen from our eyes and the most horrible of crimes ... reach the light of day?" Quotation from the first leaflet of the White Rose Group, Munich, 1942.